The franchise hopes to grow hockey in China, where there’s a greater focus on winter sports ahead of the 2022 Beijing Winter Olympics. 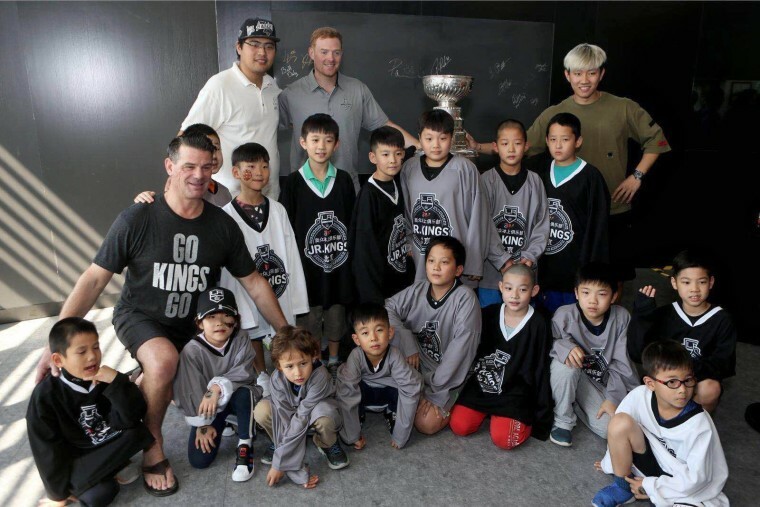 LOS ANGELES — The Los Angeles Kings announced Tuesday its establishment of the NHL’s first full-time youth development program in China. The Beijing Jr. Kings, formed in conjunction with the China-based ORG Packaging, is expected to have two or three teams initially for kids ages 8 to 10. Former King Todd Elik and ex-professional goalie Mitch O'Keefe plan to reside in Beijing as full-time coaches. Although China hasn’t necessarily been a hockey hotbed, Kings president Luc Robitaille told NBC News it would only be a matter of time before that changed. "We see an opportunity to help grow the game," Kings president Luc Robitaille told NBC News. "Everybody sees there's a lot of people there." In 2017, the nation of more than 1.3 billion had just 1,101 registered adult and youth hockey players, according to the International Ice Hockey Federation (IIHF). In comparison, Canada, population of over 35 million, boasted 631,295 registered players. But sunny California was once not so hospitable to ice hockey either. In 1967, the Kings and the Oakland-based California Seals became the first NHL franchises to set up on the West Coast. Initially, both the Kings and the Seals struggled at the gate. After just nine seasons, the Seals moved, choosing Cleveland over California. "There are 800,000 Canadians living in the Los Angeles area, and I've just discovered why they left Canada. They hate hockey,” original Kings owner Jack Kent Cooke famously quipped. The Kings, however, survived, then thrived. Buoyed by the acquisition of superstar Wayne Gretzky in 1988 and Stanley Cup championships in 2012 and 2014, the team started the 2017 – 2018 season with a club record sellout streak of 246 games. Today, that streak has been extended to 289 home games, according to the LA Times. The Kings haven't just flourished on home ice; they've succeeded off it, establishing one of the most successful youth hockey programs in North America, the Jr. Kings. Bobby Ryan (drafted 2005) and Kailer Yamamoto (drafted 2017) are among the Jr. Kings alumni who have become first-round NHL draft picks. "We have players getting Division I hockey scholarships right out of our practice facility. We have players playing in the NHL right out of our practice facility," Robitaille said. "It's happening more and more because there's been better coaching and more players playing." The franchise hopes to deliver a similar success to China, where there’s a greater focus on winter sports ahead of the 2022 Beijing Winter Olympics. Billionaire Zhou Yunjie, the chairman of ORG Packaging, has also been vocal about his desire to develop hockey in China. And while the growth may be slow, there are sure signs that ice hockey is trending in China. In 2018, the number of registered adult and youth hockey players in China ballooned from 1,101 to 12,060, according to the IIHF. The Kontinental Hockey League (KHL), widely considered to be the world's second-best hockey league after the NHL, established its first team in China in 2016, the Kunlun Red Star. Last September, the Kings and the Vancouver Canucks played the first-ever NHL games in China. This month, the Boston Bruins and the Calgary Flames squared off in Shenzhen and Beijing. "The biggest thing is everyone is making an effort to help grow the game. Sending alumni, teaching the kids," Robitaille said. "We know the government wants more people playing winter sports. And when you have a company like ORG that really wants to get involved, that's the way to do it." Meanwhile, both Elik and O'Keefe shared optimism about the potential of young Chinese athletes on ice. "China has always done very well in speed skating at the Winter Olympics, and I see a lot of very fast players here,” O'Keefe said. Through the Beijing Jr. Kings, both coaches also hope to instill more structure. "The players are used to one-on-one lessons or private lessons for 4-6 players. However, the emphasis has not been placed on hockey as a team sport. Hockey consists of 15-20 players on a team,” Elik said. He added that he hopes to see a Beijing Jr. King drafted by an NHL team in a decade – which could be considered a lofty goal. But in 1967, who could've imagined Southern California eventually producing NHL players and bringing the game to China? "I have no doubt that this program will have graduates reach the NHL one day," O'Keefe said.